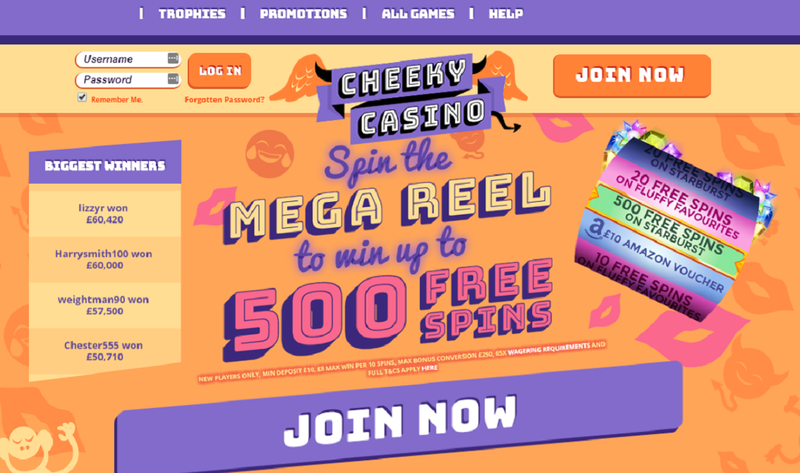 Sign up at Cheeky Casino on our site to be able use the promos and coupon codes listed below. Cashout Time: Withdrawal times can take up to 7 – 10 working days. Cheeky Casino is a quality iGaming destination from Jumpman Gaming Limited. It is licensed by the UK Gambling Commission and offers over 500 games ranging from slots and jackpots to virtual table games to bingo. New players can take a spin of the Mega Reel for their chance to win up to 500 Free Spins on Starburst or an Amazon voucher. 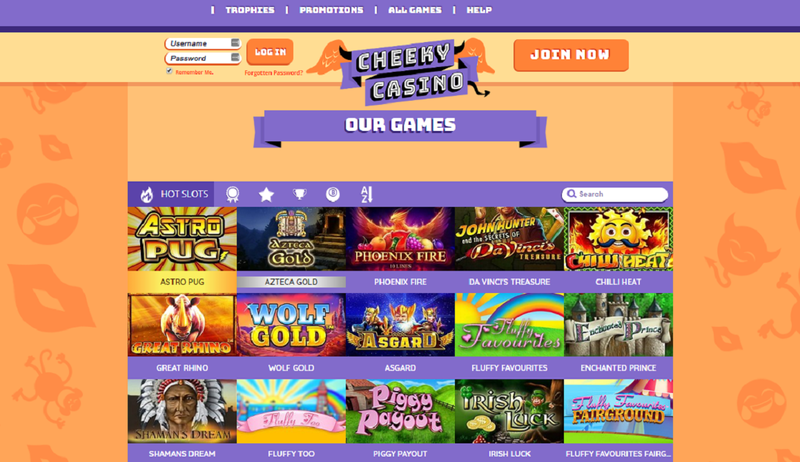 Plus, cheekycasino.com offers several ongoing promotions including a loyalty scheme and a VIP program. With reliable customer support, a variety of trusted payment methods and a responsible gaming environment, Cheeky Casino can offer you a very rewarding experience. Check it out! Cheeky Casino software includes the following providers: NetEnt, Microgaming, PariPlay, Yggdrasil, BigTimeGaming, Genii, Eyecon, Quickspin and Core Gaming. There are over 560 games, which include many hot slots, jackpots, virtual card and table games and bingo. That being said, the biggest selection of games includes slots. Cheek Casino slots include a variety of licensed and original games, including those based on popular TV shows and movies. With that in mind, some of the popular titles you’ll find include: Starburst, Skyway, Fluffy Favourties, Gonzo’s Quest, Gods of Olympus, Planet of the Apes, Sharknado and more. As for Cheeky Casino jackopts, you can enjoy big favourites like Mega Moolah, Ozwin’s Jackpots, Holmes and the Stolen Stones, etc. Virtual casino games, including Blackjack, Casino Hold’em, and Jacks or Better are also available as well as a selection of bingo games. There was no live casino offering when this Cheek Casino review was written. That said, games could be played on both desktop and Cheeky Casino mobile (iOS and Android). The Cheeky Casino Welcome Offer is different from traditional new player promotions. Instead of getting a bonus and/or free spins with your first time deposit, you get a chance to spin the Mega Reel. There are different prizes that you can win, with the best prize being up to 500 Free Spins on StarBurst. Other prizes include 20 Free Spins on Fluffy Favourites, more free spins and a £10 Amazon Voucher! No Cheeky Casino bonus code was required to claim this offer. You must be 18 years of age or older to claim it, there is a 65x wagering requirement, and full terms and conditions apply. As for other Cheeky Casino bonuses and promotions, there are ongoing cashback bonuses, Happy Hours, the chance to spin on the Turbo Reel, the chance to take part in a VIP scheme, and the chance to participate in the 200 Club for your chance to win free spins Amazon vouchers. Cheeky Casino payment methods include different options, such as credit and debit cards, prepaid cards, eWallets and mobile payments. More specifically deposit options include: Visa (debit and credit), MasterCard, Maestro, Paysafe Card, Pay by Mobile (transaction fee applies), and PayPal. Depositing is safe, secure and speedy. As for Cheeky Casino withdrawal processing times, they are not the swiftest. Initial processing takes up to 72 hours and then it can take anywhere from 7 – 10 working days to receive your withdrawn funds. Moreover, itshould be noted that while players from other jurisdictions can play at this site, this is a UK Casino. Therefore, all deposit and withdrawals is in GBP only. Cheeky Casino customer support is offered in the form of Live Chat, Email and FAQ. To access the live chat function you will need to be logged in. The FAQ answers a few basic questions regarding deposits, withdrawals, bonuses, etc., but is not overly detailed. Overall, while the casino’s support is friendly, it wouldn’t hurt for it to improve upon its customer service options. Cheeky Casino has supported play on mobile platform, you just hold your smartphone at the image area to get the direct link to Cheeky Casino on your mobile. Cheeky Casino has restricted from United States, but you can choose another casinos to play from your country.